Under threat from a mutated horde, the island is forced the cede control to General Sato—and Hana and Kenichi have a choice to make. Torn between protecting their home or standing against a threat to all of humanity, the two warriors find that their differences may divide them yet again. The outlying islands surrounding mainland Japan have been relatively isolated for as long as anyone living on them can remember. As a result, they’ve gotten used to a certain amount of independence from the ruling Shoguns and their samurai warriors. That independence has bred pride, which is going to be tested as a horde of demonic byonin swarms the mainland and threatens to spill over into their sequestered community. With Island Elder Jin at odds with the samurai General Sato, the youthful rivals Hana and Kenichi are going to have to put their differences aside for the good of all. Stories set in feudal Japan are almost never dull to me. Just portraying the depths to which the concepts of honor, loyalty, and pride were soaked into the people of that era is enough to promote a degree of interest. Take those elements and add in how they might relate to an isolated community of outcasts, set aside on Japan’s series of smaller islands, and the degree of interest goes up. Finally, toss in a demonic horde… Ooooh, buddy, now we’re talkin’! Greg Pak has done a lot, having written for some of the biggest titles in comics (World War Hulk, Iron Man, Astonishing X-Men, Batman/Superman, Teen Titans), for pretty much every publisher you can think of (Marvel, DC, Dynamite, Valiant, and- of course- Boom!). 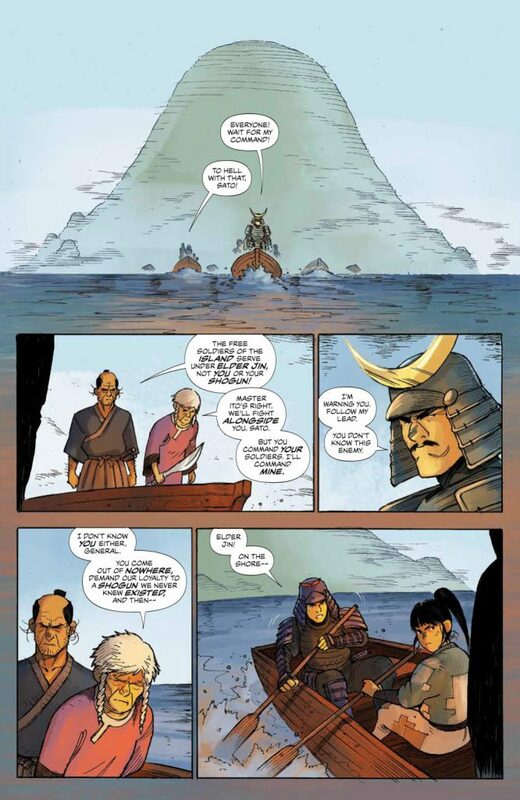 For Ronin Island, he’s left the world of superheroes behind, in favor of a more down to earth story about principle, devotion, and traditionalism. And demons. I guess I could’ve led with “demons”, but they’re pretty much just the backdrop on the story Pak’s looking to tell. Behind it all, he’s working on what it takes to bring diverse people together in a time of crisis, for the sake of the whole. Our two protagonists, Hana and Kenichi, come from very different backgrounds… Hana is full of pride in her Korean heritage as she lives among the Japanese. 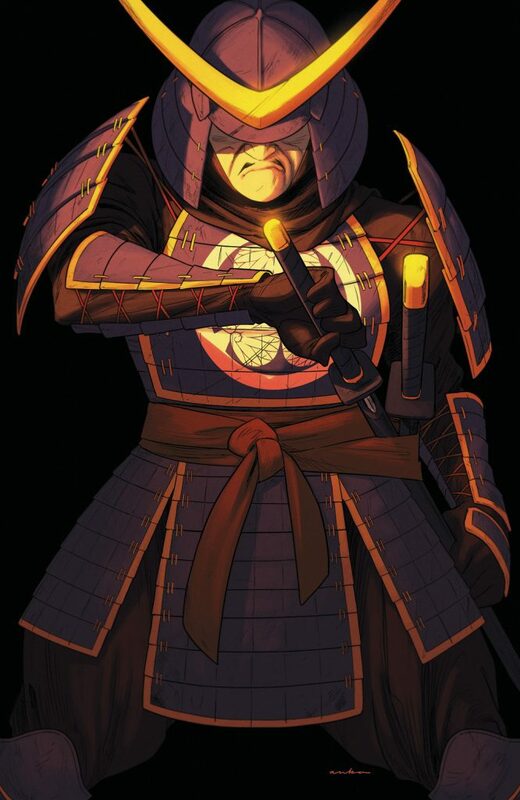 Kenichi comes from a very traditional family, with his father a samurai who has recently fallen out of favor (never a good thing for a samurai). Now, these two adversaries have to learn how to work together for their community, and in this second issue they have to re-examine just what the concept of “community” should encompass. The exploration of these traditional concepts, whose meanings can go far deeper and cover a broader demographic than some might think, elevates Pak’s story. 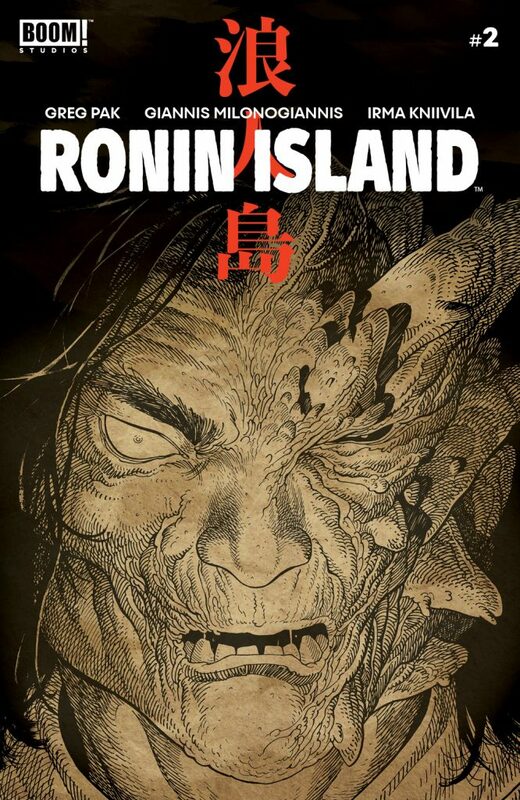 Instead of just “Samurai vs Demons” (which to be honest, I would absolutely want to check out), Ronin Island becomes something bigger and more relatable to current issues. Huh… this book became a whole lot more topical all of a sudden, didn’t it? 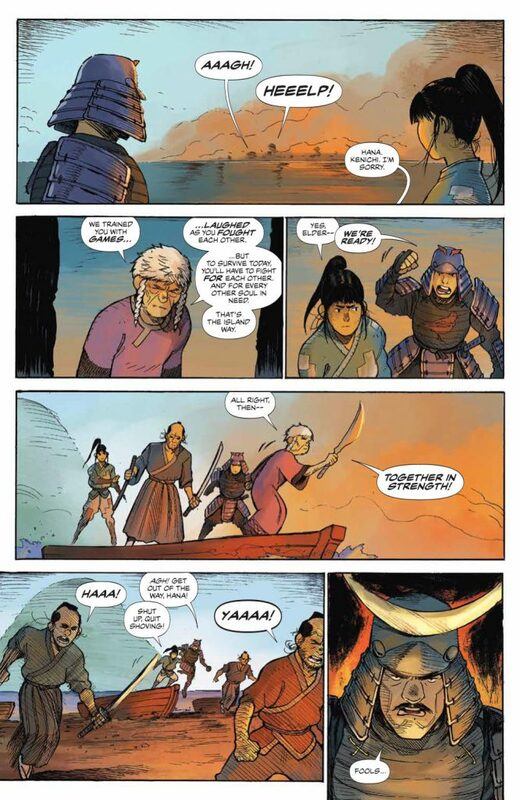 But it’s still a comicbook about Samurai mixing it up with evil and nigh un-killable demons. A book like that is gonna need an artist who can handle the various elements involved. As luck would have it, Giannis Milonogiannis is that guy. At first glance, Giannis seems to work in a fairly simplified style, almost cartoonish in the way he renders his characters. Many of the designs in Ronin Island reminded me of Avatar, the Last Airbender (a personal favorite of mine, as long as we’re talking about the animated series and not the heinous mess of a motion picture). This particular issue features a fairly extended combat scene, in which a liberal use of blur lines imparts a sense of dynamic action that flows well from panel to panel. Milonogiannis also does a great job with his layouts, using a combination of traditionally formatted and overlapping panels. The effect keeps the whole thing moving along, never seeming monotonous or repetitive. Pak’s words and Milonogiannis’s illustrations are beautifully fleshed out by some solid coloring and lettering. 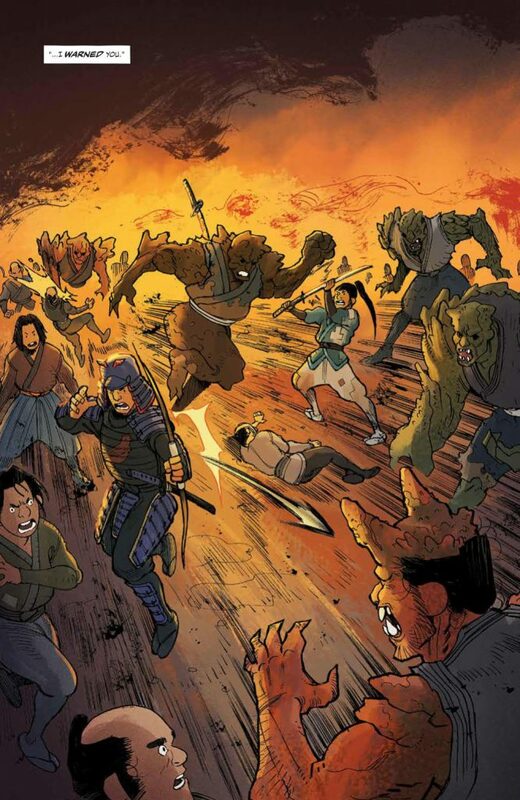 The former, handled by Irma Kniivila, gives the world of Ronin Island a dusty feel, in keeping with the action as the battle kicks up all manner of debris. The lettering of Simon Bowland imparts all of the sounds of a full scale battle we could expect… “SHOKK” and “THOKK” mean pretty much what they would sound like as sword blade and arrow are put to work dismantling Byonin craniums. 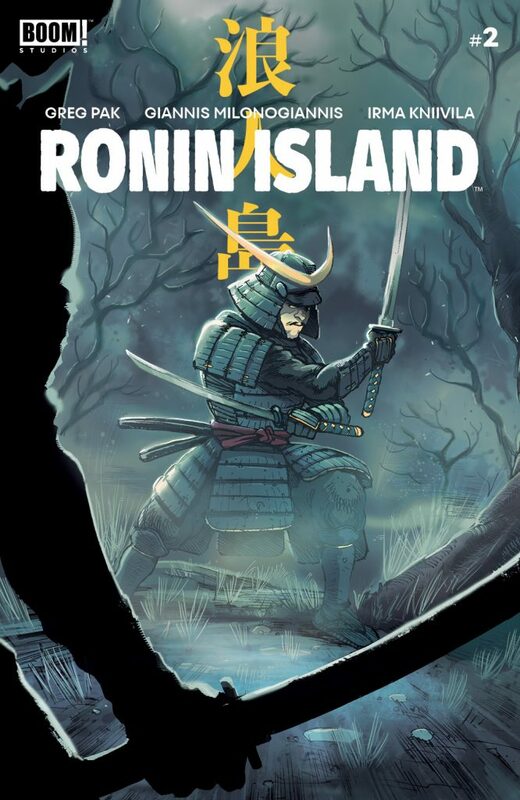 Ronin Island works, and should be able to find appeal through a pretty decent age range- I’m not saying it’d be great for younger kids, as the violence is there and does get a little intense, but it doesn’t go over the top as far as how graphically it’s shown. Also, it does a pretty good job of slipping some social value in there by challenging its characters to question whether or not traditional values should be the extent of moral responsibility, and if what divides us is really as big a barrier as we might think.